Fender Hole Patch 1930-31. They go on the edge of the fender where it is bolted to the frame towards the front. Sold as a set of 4 which is enough for 2 front fenders. Made in USA. Headlamp Bar Patch 1928-29. Repairs the area of the fender where the headlamp bar attaches. Headlamp Bar Patch 1930-31. Repairs the area of the fender where the headlamp bar attaches. Fender Tail Lamp Patch 1929-31. A repair patch for the area of the rear fender where the tail lamp bracket is attached. Patch is 19 gauge and is 4-1/2" x 6-1/2". Made in USA. 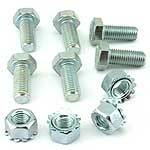 Special large headed bolt that get welded or brazed to the body for the rear fenders to mount on. You'll need 4 per fender. Made in USA. This set contains the 8 flat washers, lock washers and nuts to mount both rear fenders to the body mounting studs. This small cast clip goes between the fender brace and the fender on the outside edge. They prevent the bead from being smashed when the bolts are tightened up. Made in USA. Fender Edge Bolts 1928-31. 1/4" carriage bolts that attach the outer edge of the fender to the fender brace. Nuts & lock washers included. Mounting Screws for the 1928-29 Ford Model A Radiator Apron. Pressed steel design for the 1928-29 model A Ford. Very good reproduction! Fits either side. Made in USA. The stamped design for the 1930-31 front fenders. Some of the 30's actually did use a cast fender brace, but none are being made today. Made in USA. Rear Fender Brace in Cast Iron 1928. Fits Coupes, Pick-ups and Roadsters. Made in USA. 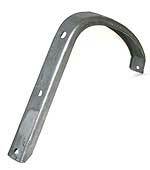 Pressed steel brace for the rear fenders of the Coupes, Cabriolets, Roadsters, and Pick-up trucks. Made in U.S.A. Pressed steel brace for the rear fenders. Pressed steel rear fender brackets for the 4-Door and the 2 -Door sedans. Made in U.S.A. 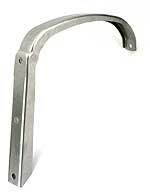 These brackets are used for the rear fenders of the 30-31 Deluxe 2-Door Phaeton only. Bolts needed to mount the front fender brace to the frame. Does both braces. This set is for cast fender braces braces. Made in USA. Bolts needed to mount the front fender brace to the frame. Does both braces. This set is for stamped steel braces. Made in USA. 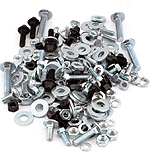 1928-31 Rear Fender Brace Bolt Set. This kit bolts the rear fender brace to the body. 1 kit does both sides. Made in USA. 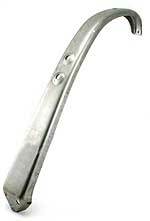 1928-29 Right Steel Front Fender . These fenders are being sold on 'as-is' Basis. The 1928-29 fenders are pretty good, but normally need work done to them before they will fit on the car properly. The possible problem areas are: holes not always in proper location, width where fender meets running board is not always consistent, and the radius area where the running board splash apron meets normally needs reworked. These are sold as-is with no guarantees. 1928-29 Left Steel Front Fender. These fenders are being sold on 'as-is' Basis. The 1928-29 fenders are pretty good, but normally need work done to them before they will fit on the car properly. The possible problem areas are: holes not always in proper location, width where fender meets running board is not always consistent, and the radius area where the running board splash apron meets normally needs reworked. These are sold as-is with no guarantees. 1928-29 Right Steel Front Fender with spare wheel well. These fenders are being sold on 'as-is' Basis. The 1928-29 fenders are pretty good, but normally need work done to them before they will fit on the car properly. The possible problem areas are: holes not always in proper location, width where fender meets running board is not always consistent, and the radius area where the running board splash apron meets normally needs reworked. These are sold as-is with no guarantees. 1928-29 Left Steel Front Fender with spare wheel well. These fenders are being sold on 'as-is' Basis. The 1928-29 fenders are pretty good, but normally need work done to them before they will fit on the car properly. The possible problem areas are: holes not always in proper location, width where fender meets running board is not always consistent, and the radius area where the running board splash apron meets normally needs reworked. These are sold as-is with no guarantees. 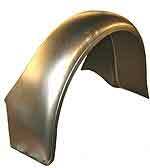 1930-31 Right Steel Front Fender. These fenders are being sold on 'as-is' Basis. The 1930-31 fenders normally need work done to them before they will fit on the car properly. The possible problem areas are: holes not always in proper location, width where fender meets running board is not always consistent, and the radius area where the running board splash apron meets normally needs reworked. These are sold as-is with no guarantees. 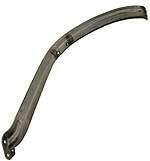 1930-31 Left Steel Front Fender. These fenders are being sold on 'as-is' Basis. The 1930-31 fenders normally need work done to them before they will fit on the car properly. The possible problem areas are: holes not always in proper location, width where fender meets running board is not always consistent, and the radius area where the running board splash apron meets normally needs reworked. These are sold as-is with no guarantees. 1930-31 Right Steel Front Fender with spare wheel well. These fenders are being sold on 'as-is' Basis. The 1930-31 fenders normally need work done to them before they will fit on the car properly. The possible problem areas are: holes not always in proper location, width where fender meets running board is not always consistent, and the radius area where the running board splash apron meets normally needs reworked. These are sold as-is with no guarantees. 1930-31 Left Steel Front Fender with spare wheel well. These fenders are being sold on 'as-is' Basis. The 1930-31 fenders normally need work done to them before they will fit on the car properly. The possible problem areas are: holes not always in proper location, width where fender meets running board is not always consistent, and the radius area where the running board splash apron meets normally needs reworked. These are sold as-is with no guarantees. 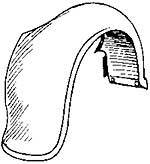 1928-29 Left Rear Fender. These fenders fit the roadster, Coupe, Cabriolet and Pickup Trucks. They dont fit the wide Bed Truck. Excellent Quality! Made in USA. 1928-29 Right Rear Fender. These fenders fit the roadster, Coupe, Cabriolet and Pickup Trucks. They dont fit the wide Bed Truck. Excellent Quality! Made in USA. 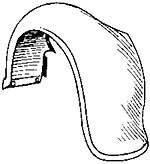 1928-29 Left Rear Fender for the 1928-29 Tudor sedan, 4-door sedan, 4-door Phaeton, and Station Wagon. Fit and quality of these fenders is "fair". We recommend using them in pairs as they don't exactly match the originals. 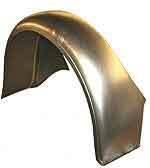 Made in U.S.A.
1928-29 Right Rear Fender for the 1928-29 Tudor sedan, 4-door sedan, 4-door Phaeton, and Station Wagon. 1930-31 Left Rear Fender . These fenders fit the roadster, Coupe, Cabriolet and Pickup Trucks. They dont fit the wide Bed Truck. Excellent Quality! Made in USA. 1930-31 Right Rear Fender. These fenders fit the roadster, Coupe, Cabriolet and Pickup Trucks. They dont fit the wide Bed Truck. Excellent Quality! Made in USA. 1930-31 Left Rear Fender. The sedan style fender that fits: 4-door Phaetons, Tudor Sedans, 4-door sedans, Victoria and A400. Fit and workmanship on these is not the greatest and they normally need work. Made in USA. 1930-31 Right Rear Fender. The fender that fits: 4-door Phaetons, Tudor Sedans, 4-door sedans, Victoria and A400. Fit and workmanship on these is not the greatest and they normally need work. Made in USA.